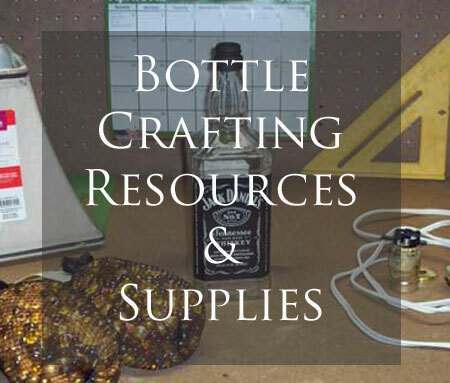 Tools, resources & supplies you will need for your own DIY Bottle Projects. A good, high power, corded electric drill works great if you’re planning on making just one or two Bottle Lamps. This 8 Amp 3/8 inch Pistol Grip DEWALT Drill DWD110K is designed for flexibility and is built to allow ergonomic hand positioning with a soft grip so your hands will not get too tired. 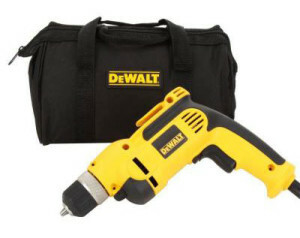 Drill comes with a durable kit bag for safe keeping. Believe me, once you have a drill like this it will come in handy for many other projects around the house. Available for only $59.00 from Amazon, this is a steal! This Drill Bit Set by Vermont American is a four piece set that includes a 1/8″, 3/16″, 1/4″ and 5/16″ drill bits. You might also need a 1/2″ glass cutting drill bit. I use one, but don’t drill all the way through the bottle with it. I have come to find that these drill bits by Vermont American are the best on the market and last for a long time. Always wear gloves and be careful when using these bits, they get very hot during the drilling process. Only $14.87 for the set! 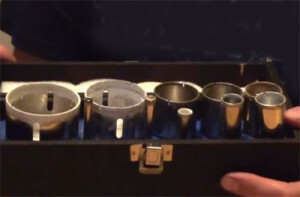 I received this 10 Piece Diamond Hole Saw Set for my drill press as a gift from my wife last year. It turned out to be an absolute life/time saver and comes in a nice wooden box for storage. Sizes are as follows: 1/4 in., 3/8 in., 1/2 in., 3/4 in. and 1 in. on 1/4 in. Shank Sizes: 1.1/4 in.,1.3/8 in., 1.1/2 in., 2 in., 2.3/8 in. on a 3/8 in. Shank. 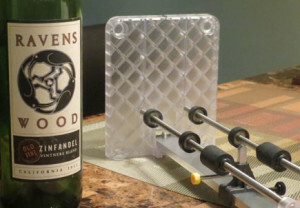 This Diamond Hole Saw Set by SE makes a great gift for any bottle crafter. Free shipping and only $41.69 per set, this is an unbelievable deal. If you are planning on making Bottle Lamps to give away to your friends and family, or if you have your own business and are in need of signage, you should seriously consider buying a Bench Drill Press. I have been using a bench drill press to make our Bottle Lamps for a while now and it cuts the drill time down to a few minutes versus almost half an hour. I received my stationary drill press as a gift, but we found this WEN Drill Press on Amazon. It has great reviews, is very reasonably priced and they even offer free shipping. 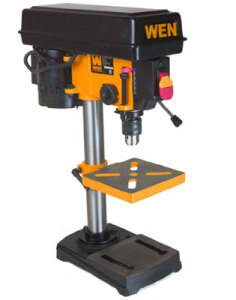 On sale for only $79.99 – read my full drill press review, includes set up video. 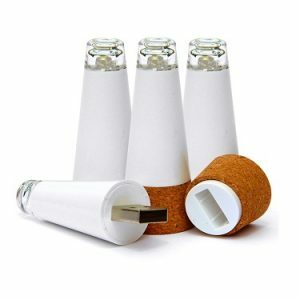 The wine bottle neck cork light can be charged in as little as 20 minutes, lasting up to two hours. Turn any empty bottle into a decorative centerpiece. Simple to charge (light plugs into a USB port) and simple to use. To turn on and off just twist the external light on top. This cork light can also double as a safety light for a staircase or pathway. LED Cork Bottle Lights can provide safety for an entire room during a blackout. This set of 4 cork lights retails for only $22.90. If you don’t want to invest money in an electric drill you can always use a Rotary Tool for drilling glass. Rotary tools are one of the most flexible tools around and work well for drilling the occasional glass bottle. 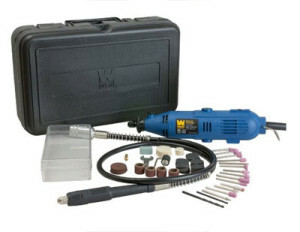 The WEN 2305 Rotary Tool Kit with Flex Shaft allows for precision details on your craft projects and comes with all the accessories (80 pieces) you see in the picture and a hard case for carrying and easy storage. Only $24.15 & free shipping on orders over $35. 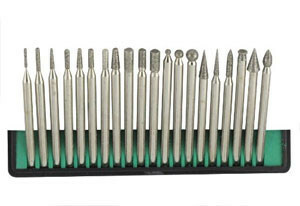 This is a very inexpensive, yet professional and high quality, glass drilling Bit Set to use with the rotary tool above. This set of 20 bits costs less than one high-quality diamond bit from other sources. The bits work great on glass, metal, and stone. Again, if you only want to drill one or two bottles then purchasing a rotary tool and these diamond tipped drill bits is the way to go. Only $5.25 for the set. We have used Bottle Fillers for many of our DIY bottle projects. The most asked about filler we use is this crystal or diamond fill, it’s a vase filler made of little acrylic pieces. It adds a nice touch by defusing the light, plus it gives the bottle extra weight which is especially important if you’re making a lamp that might be a little top heavy. As a filler for our lamps and lighted bottles we have also used marbles, coffee beans, glass jewels and various other items. This beautiful crystal filler from Amazon is only $8.99 for a 2 lb. bag. Many unique bottle projects have been accomplished by adding Flat Marbles. The flat yellow marbles you see in the picture are a wonderful bottle filler for adding weight and substance to an empty liquor bottle. With the added light string in the bottle these marbles almost look like liquid. Another great way to use marbles is to hot glue them to the outside of your bottle. You can use multi-colored marbles to make unique designs or add ribbons and a variety of other adornments. Yellow flat marbles are only $18.99 for a 5 lb. bag (available in many other colors). We have used the Westinghouse #70025 Make A Lamp Kit on many of our bottles now. This light kit is very easy to use and comes with three different rubber adapters to fit different sized bottle necks. The Westinghouse lamp kit includes all the necessary hardware to turn your bottle into a fully functioning lamp. At only $9.90 you will not find a better or cheaper lamp kit anywhere. The US plug Lamp Power Cord with dimmer switch is used for adding the convenience of being able to turn your bottle lamps on and off without unplugging them. The cable is 6 feet long and has a suitable rating of AC110V/AC250V. The Uxcell lamp power cord is available in white, black or brown for only $6.03 plus free shipping. 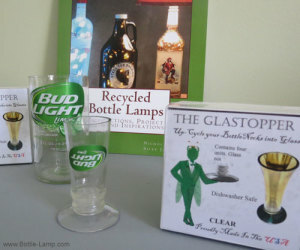 Vintage looking light bulbs can take your bottle lamp project to the next level. 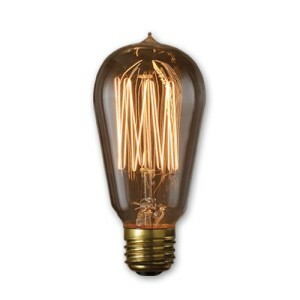 This Edison Light Bulb is ideal for use in bottle lamps, outdoor lanterns, ceiling fixtures, chandeliers and pendants. 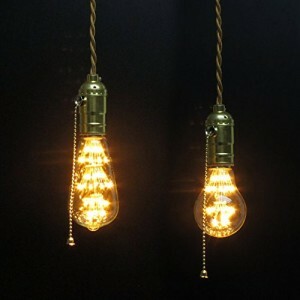 Nostalgic bulbs are available in multiple bulb shapes, filament styles, and wattage. Perfect for Steampunk designs! Pricing starts at $6.49. Fun and colorful hanging Pendant Light Cord kits by Color Cord Company are UL listed with 15 feet of premium quality textile braided (cloth covered) wire. Medium base (E26) light bulb socket with removable 1 5/8″ shade ring. Use without the ring for an industrial/Steampunk look. 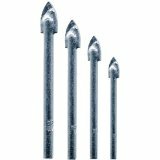 Ceiling mounting hardware includes 2 ceiling stud hooks, 2 ceiling hook bolts with drywall toggle anchors. Available in 17 gorgeous colors! Only $30 per kit. “Squirrel Cage” vintage design light bulb. This style LED Light Bulb is perfect to use in a bottle lamp without a lamp shade. A very warm color temp of 2700K ensures a vintage filament type color. The decorative vintage bulb by Kiven is fantastic for atmospheric lighting, in a multi-bulb pendant light, as well as discreet lighting. $13.39 per bulb. Finding Mini Light Strings other than around Christmas time isn’t always easy. Last year we picked up numerous sets of light strings on sale after the holidays and still ended up ordering more online after a few months. 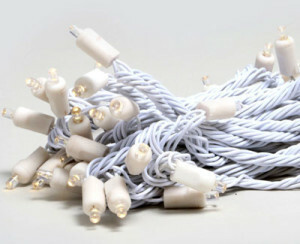 When purchasing light strings on-line be sure to get the ‘non connectable’ light strings. These 35 mini lights work perfectly for colored wine bottles (colored light sets are also available). Keep in mind that your bottle will get a little bit warm to the touch, not enough to start a fire or anything. 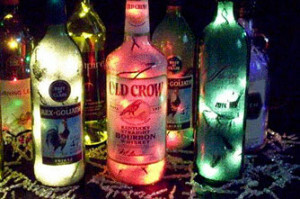 It’s best to just use these lights by themselves, without any fillers inside the bottle. Available on Amazon for only $6.99 plus free shipping. 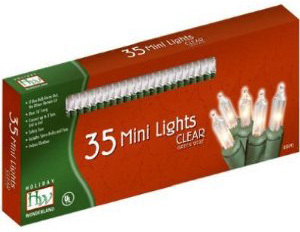 This commercial grade LED Mini Light Set from Novelty Lights is fairly inexpensive and comes with either green or white wire. LED lights are cool to the touch and use very little electricity, making them environmentally friendly. These long lasting LED light sets are perfect for craft projects, like lighted wine bottles and bottle lamps, because they do not have the female socket for end to end connection of multiple strings. LED lights are also available in a variety of colors from blue to red to green to yellow and multi. Get them here for only $10.95 per set. 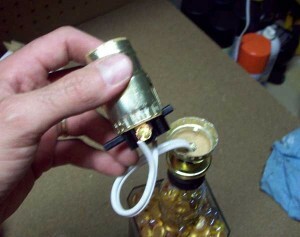 Planning on making your own Lamp Shades or decorating the outside of your lighted bottles with jewels? 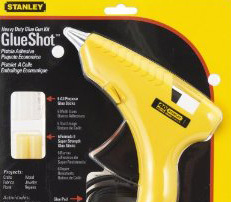 This Stanley GlueShot Glue Gun will be your best friend. The glue heats up quickly and flows evenly with the help of a trigger feed mechanism. This inexpensive kit includes a Standard Hot-Melt Glue Gun Kit, (6) all purpose glue sticks and (6) Formula II super strength sticks, all for only $10.61. For most of our bottle lamps we use 7 – 7.5 inch shades. Lamp Shades come in different shapes and all sorts of colors and patterns. 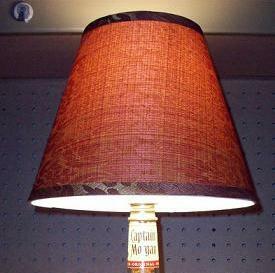 Try to find a lamp shade that fits the style and personality of your bottle. 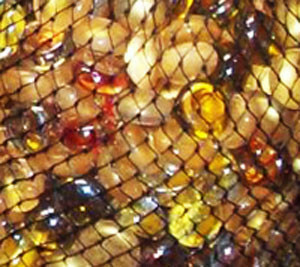 It’s also fun to add beads, fringes, glow in the patterns, or whatever else you can think of to make your lamp unique. Check out our How To Make A Lamp Shade in six easy steps or click the button below to browse for a new lamp shade online starting at only $5.97. These doughnut shaped plugs snap into the holes after you drilled into your recycled bottle. While protecting the cable insulation from damage they also conceal the sharp edges of the glass. Flexible black vinyl 1/4″ grommets. These Rubber Grommets are used if you’re attaching a cord with a switch to make a bottle lamp or if you’re replacing the electrical plug on a light string. Only $4.27 per set of 6, these grommets will make the back of your bottles look professional. A high-tech, dependable Bottle Cutter that is simple to use and creates precise scores around the bottle. Constructed from a poly-carbonate plastic, durable stainless steel slide bars, enclosed rubber coated ball bearing rollers (to keep out glass slivers), and is the only Made In USA bottle cutter with a carbide cutting wheel. This is our go-to bottle cutter and can score beer bottles, wine bottles, square bottles, triangular bottles and even oval bottles. Cut just about any bottle with a flat bottom for endless crafting possibilities. Only $89.99 plus free shipping. 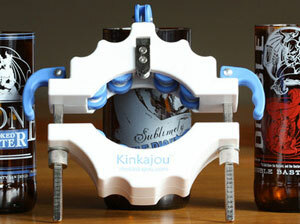 The Kinkajou Round Bottle Cutter is a less expensive alternative for cutting wine, beer and liquor bottles. It cuts round bottles from 43 -102 mm in diameter. Fun and easy to use, this bottle cutter is perfect for hobbyists and crafters making bottle projects. The Kinkajou comes in several different color options and also includes sandpaper, seperation rings and a bunch of really cool stickers. Available for only $49.99. Sturdy and easy to use, this glass bottle cutter comes right out of the box and hits the ground running. Spending a little extra for the “Deluxe” kit will also get you a heat tool for assisting with the glass separation process. 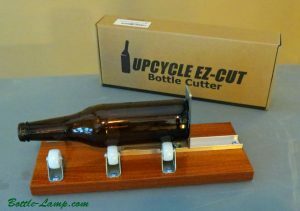 The “Upcycle EZ-Cut” professional bottle cutter deluxe kit was created to make a better wine and beer bottle cutting experience. The kit is available for only $46.99 plus shipping. The Creators Bottle Neck Cutter allows you to quickly and safely cut the neck off a bottle. Made in the USA, this unique bottle cutter gives you a precision cut each and every time. Simply set the stabilizing plug in the bottle opening, adjust the height of the score by turning the knob, hold the sides of the cutter firmly and then rotate the bottle while applying pressure. Able to cut tapered and straight bottles from half-inch to a depth of approximately four-and-a-half inches. Available for only $49.95 on Amazon. Up-cycling cut bottles into glasses, vases, and other crafts is a lot of fun until its time to sand the bottle edge smooth. It used to be a long, boring and very tedious part of the process. Now you can let the Bottle Bit do all the work for you. Be sure to check out Nick’s review video to see this great bottle crafting tool in action. 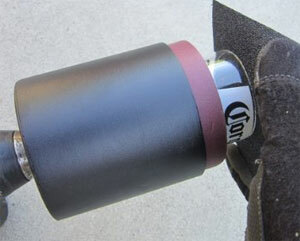 The Bottle Bit will save you hours of hard work sanding down the rough edges of your cut bottles. Simply attach the bit to your drill insert the bottle using the included foam can holder and start sanding with your choice of wet sandpaper. Check out our how-to YouTube video for more instruction. Available for only $59.00 with free shipping on Amazon. These little gadget create a new up-cycling opportunity. Create personalized and unique goblets and glasses with your cut off bottle tops! 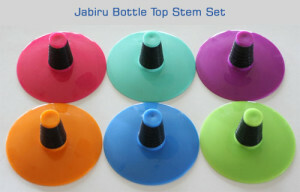 Jabiru Bottle Top Stems in Friday Night Fun, other fun colors are also available. Featuring a hard plastic base and rubberized stems. 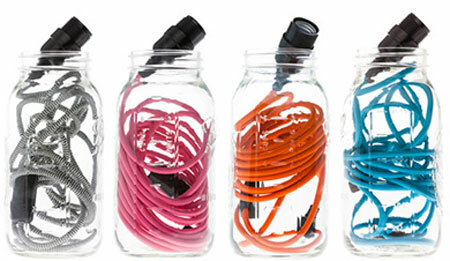 These fun bottle top stems will fit about any bottle top size, creating a waterproof seal. Only $18.99 for a set of 6. Great inexpensive gift idea! This mini gun offers a concentrated heat source that is designed to focus on a small area. You really will not have to run the gun that long over your separation line to get a cleanly cut bottle. 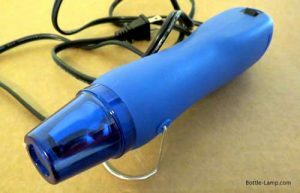 This mini heat gun is also great for melting embossing powder, shrinking gift wrap/tubing, phone repair and other crafts! Have a better success rate of cut bottles perfectly with this bottle cutting heat tool. Available for only $17.99 + $4.96 shipping. 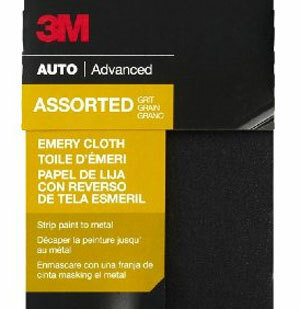 The 3M Emery Cloth will make smoothing out your cut bottle edges simple and easy. This 9 x 11 inch pack comes with three different grits, fine, medium and course. Cloth backing makes this strong and durable for multiple uses. There are a bunch of 5 star reviews from fellow bottle crafters for this product, like this one “I added this to an order for a bottle cutter. I am so glad I did. It’s really good stuff.”. We know of at least one bottle cutter company that sells little pre-cut sand paper packets for around $20. There’s also a ‘special’ bottle sanding kit for $40. Yikes! This is a great bargain for only $2.58/pack. 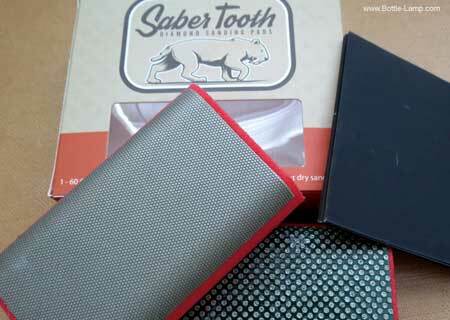 The Saber Tooth Sanding Pads are made to last. People say you should always use the right tool for the right job. Well when it comes to smoothing out a sharp glass edge, nothing beats diamonds! There are other diamond pads on the market but none of them have Bottle Cutting Inc.’s custom designed curved edges to make getting inside the bottle effortless. Check out Nick’s review video to learn more. The pack includes: 1 – 60 grit saber tooth diamond sanding pad, 1 – 400 grit saber tooth diamond sanding pad and 12 sheets of 2000 grit wet/dry sand paper. The Saber Tooth works great while using the Bottle Bit (see above). On sale for $49.99/pack. Visit our About Us page and let us know if you’re looking for a specific item not listed on this page. Please take note that some of the above links take you to Amazon. We will receive a small incentive if you make a purchase, please visit our Privacy page for more information. All of the items on this page have either been personally used and tested by us or we believe it is a product worth recommending. It will state so in our descriptions. Nick and I started buying most of our crafting supplies, as well as other items online. Amazon has a huge selection of products at reasonable prices and if you’re a prime member, like us, a lot of them ship for free. Here is a good example why shopping local isn’t always such a good deal. We finally came out of the dark ages and purchased smart phones a while back. Thinking a case for our phones would be a good buy, we priced the cases at the cell phone store. They had a variety of them priced anywhere from $20 – $50, a little steep so we decided to wait. When we got home we checked on Amazon and found much nicer hard cases for under $5.00 each. What a difference! Shopping local is important, but if there’s a huge mark up then you’re better off buying your supplies online.